The Yankees had a lot of first basemen this year. Too many? Too many. In total, 11 different people manned first this year with Greg Bird probably the finest after he overcame his ankle issues. Chase Headley is the runner-up there, filling in admirably there once Todd Frazier took third base from him. But there were many others at first. And so let’s dive in, beginning with the person who could have claimed the job for himself if he hadn’t hit so poorly. Carter signed in mid-February with the Yankees. At the time, the plan was simple: Bird would be the starting first baseman while Carter was the backup who’d get some tough lefties as well as some time at DH. Not much glamour for a guy who’d just led the National League with 41 home runs in 2016, but it was $3.5 million he wasn’t getting elsewhere. So when Bird went 6-for-60 in April and landed on the disabled list, the job was Carter’s to lose. And boy did he lose it! In 62 games for the Bombers, the slugger didn’t live up to his reputation, hitting for 14 extra-base hits in 208 plate appearances, including just eight home runs. Meanwhile, he found a way to strike out even more than he did in Milwaukee while drawing fewer walks. His .201/.284/.370 (73 wRC+) line doesn’t do it justice. He was hovering below or at the Mendoza line for the entire first half. Of course, this wouldn’t be nearly as much of an issue if he was a good defensive player. However, that’s never been Carter’s calling card. He had a -2.3 UZR at first. Carter did come up with some clutch hits in pinstripes. He came up with a much-needed seeing-eye single to give the Yankees a run in a 3-2 win over the Cardinals on Apr. 15. A week later, he hit a go-ahead pinch-hit three-run shot to put the Yankees up for good against the Pirates. And on May 3, he had a bloop single to tie a game against the Blue Jays. Finally, on June 15, just a week before he was designated for assignment, he tied a game against the Athletics with a solo homer in the eighth inning. After an 0-for-4 with three strikeouts game, he was DFA’d on June 23. However, he was brought back a week later when Tyler Austin strained his hamstring. This stint would be short-lived as he was again DFA’d after going 0-for-2 with a walk against the Blue Jays on July 4. From there on out, it was a mix of first basemen in the Bronx. While Carter was struggling in late May, the Yankees decided to give Rob Refsnyder a go at first. However, he was somehow less adequate with the bat than Carter. In four starts from May 30 through June 4, he went just 2 for 13 with a walk. That’s a .154/.214/.231 line. Yikes. While he’d play a little too much in the outfield for the rest of the month, he wouldn’t get any more time at first base, a place where he actually wasn’t too bad in 2016, at least relative to the rest of his performance. His last game in New York was July 2 before he too was sent packing like Carter. The Yankees traded Refsnyder to the Blue Jays for minor league first basemen Ryan McBroom. Ah, the Ji-Man Choi era. This was perhaps the best part of the season. He started at first the day after Carter was DFA’d, literally taking his spot on the roster. His first at-bat was an unremarkable groundball to first, but he struck gold with a homer into the bleachers in his second at-bat. He’d hit a homer in his second game against the Brewers — a much less impressive ball that cleared the short porch in right — and that was about it for him in New York. After the second homer, he went hitless for seven straight at-bats until pick up a pair of hits — and a sacrifice fly — in his final game, a 3-0 win over the Red Sox on July 16. Choi was sent down after that and would be removed from the 40-man roster later on. In his six games, he went 4-for-15 with two homers, a double, two walks and a sac fly, good for a .267/.333/.733 line. That’s a 162 wRC+, second on the team behind Aaron Judge for players with at least 10 plate appearances. After Carter was let go, Brian Cashman looked for cheap first base help and found it with Garrett Cooper, who was in Triple-A with the Milwaukee Brewers. A 26-year-old tearing up the Pacific Coast League isn’t a huge shocker, but it was something the Yankees didn’t have, so they traded left-handed reliever Tyler Webb to get him. Cooper started at first in the Yankees’ first two games after the All-Star break and struck out in five of his first seven plate appearances. He didn’t get a hit until his third game. While he didn’t hit for any home runs with the Yankees, he did launch a lot of doubles. Five of his 14 hits were two-baggers while he also added a triple. He just didn’t walk much (once in 45 PAs) and he struck out 26.7 percent of the time. Still, he posted a .326/.333/.488 (113 wRC+) line and likely would have held the job until Greg Bird’s return. However, he didn’t play after Aug. 16 due to hamstring tendonitis. He was traded this offseason to the Marlins to free up 40-man space. We’ll always have his eight hits in three days against the Blue Jays this August. Austin could have been the Yankees’ starting first baseman for multiple months this season. All he needed to do was stay healthy. However, he broke a bone in his left foot during Spring Training and was out until June. He was called up to replace Carter and hit a home run in his third game back, just to strain his right hamstring a day later. Oh well. Austin got another week of starts at first base and DH in August when Cooper went down and picked up two hits in his first game back. However, once Bird was healthy, it was back to the bench for the 26-year-old Austin. Unlike everyone listed above, he’ll be back in 2017 as of now, although he’ll likely be in Triple-A to start the year if he makes it through the offseason. I’ll be brief, but here are the other highlights at first base outside of Bird and Headley. – Gary Sanchez played three innings over two games at first base. He made seven putouts in seven chances. No errors! – Matt Holliday started seven games at first and made two errors. He was not smooth in the field and it would have been fitting if the Yankees had put together a Carlos Beltran-esque ceremony to retire his glove. – Despite having 82 starts at first in his career, Todd Frazier didn’t play a single inning at first for the Yankees. – Austin Romine started four games at first base. He actually didn’t look too bad at first and as crazy as it is to say now, it was a relief to see him there compared to their other options at the time. – And finally, the best moment at first base non-Bird/Headley edition all year: Bryan Mitchell’s unfortunate inning. Perhaps my favorite Yankees loss of the year. So long, Chris Carter. He’s been released, the Yankees announced. I thought they would try to outright him to Triple-A Scranton again considering the first base depth chart is so thin, but I guess not. Keith Law (subs. req’d) wrote about RHP Domingo Acevedo’s rough Futures Game performance. “His delivery is so uncoordinated and unrepeatable that I find it hard to believe he’ll ever see even fringe-average command,” write Law. Acevedo gave up three runs and rockets to the first five batters he faced Sunday. Meanwhile, Ken Davidoff spoke to Acevedo about his Futures Game performance. “Today I wasn’t as sharp as I’ve been. You can learn from these experiences,” he said. Interestingly, Acevedo said he spoke to Aroldis Chapman about his mental approach to pitching back in Spring Training. RHP Brody Koerner and RHP Gilmael Troya were named the Pitchers of the Week for the Double-A Eastern League and Rookie Appalachian League, respectively. Koerner threw 13.1 scoreless innings in two Double-A starts, his first two starts at the level. He has a heavy mid-90s sinker and iffy secondary stuff. Both Triple-A Scranton and Double-A Trenton are off until Thursday for the All-Star break. Their All-Star Games are tomorrow. LHP Caleb Smith will represent the RailRiders while LHP Nestor Cortes, LHP Nestor Cortes, SS Thairo Estrada, RHP Yefry Ramirez, and OF Zack Zehner will represent the Thunder. Dustin Fowler (injury), LHP Justus Sheffield (injury), and 1B Mike Ford (promotion) were all selected to the All-Star Game but won’t participate for various reasons. High-A Tampa, Low-A Charleston, and Rookie Pulaski all had scheduled off-days. Most minor league teams have an off-day today so they don’t interfere with the MLB All-Star Game. Chris Carter’s second stint in pinstripes is over. Following yesterday’s loss, the Yankees designated Carter for assignment for the second time this season. Second time in the last two weeks, really. The only reason he was brought back was Tyler Austin’s hamstring injury. The Yankees decided enough was enough yesterday. All told, Carter hit .201/.284/.370 (73 wRC+) with eight homers and a 36.5% strikeout rate in 62 games with the Yankees, including 1-for-12 (.083) with four strikeouts since being brought back. When a guy is in the lineup for his bat and he’s being removed for pinch-hitters like Austin Romine and Tyler Wade in the late innings, the writing was on the wall. Joe Girardi’s patience ran out weeks ago. With Austin and Greg Bird still sidelined, the Yankees will now turn the first base reins over to Ji-Man Choi, a 26-year-old journeyman on a minor league contract. Choi has bounced from the Mariners to the Orioles to the Angels to the Yankees over the last 19 months. Last season, in his first and so far only big league stint, Choi hit .170/.271/.339 (67 wRC+) in 54 games with the Halos. If he does that again, he’ll be a downgrade from Carter. The Yankees are turning to Choi for three reasons, basically. One, they’ve exhausted their patience with Carter. They’ve given him plenty of chances and he hasn’t produced. The Yankees and Girardi would live with the strikeouts if he were hitting the ball out of the park like last season, but he’s not. He’s not hitting home runs and his defense, which was fine in April and May, has become untenable. Carter has failed to make too many routine plays. Two, Choi has been hot lately. He’s hitting .289/.371/.505 (137 wRC+) in 56 Triple-A games overall this year, and that includes a 14-for-45 (.311) stretch with six home runs in his last 12 games. He has eight home runs on the season overall, and six have come in the last two weeks. If you’re going to make a change and bring up someone new to play first base, the guy who is on a hot streak in Triple-A is as good a choice as anyone. And three, the Yankees simply have nowhere else to turn. Bird is hurt, Austin is hurt, Matt Holliday is hurt, and playing Romine or Rob Refsnyder at first base on an everyday basis is not something anyone wants to see. I know I don’t. The trade market has yet to heat up too. Choi is the best option. Once the Yankees decided Carter wasn’t their guy, next up on the depth chart was Choi because of injuries. Make no mistake though, Choi is a band-aid, not a permanent solution. I mean, I suppose he could have an unexpected hot streak and hold things down until Bird and/or Austin return, though I can’t imagine the Yankees are expecting Choi to be the guy at first base going forward. Brian Cashman and his staff are surely scouring the trade market for a more permanent solution will Bird’s status is unknown. The Yankees have lost 15 of their last 21 games (!) and the bullpen has been the primary culprit. First base has been a problem all year though — even when Bird was healthy, he stunk — and the Yankees reached the point where it was time to try someone else. Heck, they reached that point with Carter a few weeks ago, but then Austin got hurt. I don’t think Choi is the answer and yeah, he can be worse than Carter, but the bar has been set so low. It was time to try someone new. Chances are the Yankees will again be looking to try someone new in a few weeks. For the third straight day and ninth time this season overall, the Yankees will have a player make his MLB debut tonight. Outfield prospect Dustin Fowler has been called up and is in tonight’s lineup. Tyler Wade on Tuesday, Miguel Andujar on Wednesday, and now Fowler on Thursday. Three days, three top 100-ish prospect debuts. Pretty cool. It is warm, humid, and cloudy in Chicago today. And there’s rain in the forecast. Not as much as last night, but some. We’ll see how it goes. Tonight’s series finale will begin a bit after 8pm ET and you can watch on WPIX. Enjoy the game. Injury Updates: CC Sabathia (hamstring) threw a three-inning simulated game and declared himself ready to return to the rotation. He doesn’t get to make that call though. I’m guessing the Yankees will wait to see how Sabathia feels tomorrow before determining the next step … Tyler Austin (hamstring) has been placed on the 10-day DL with a “high grade” hamstring strain, the Yankees announced. He said he’s been nursing the hammy for a few weeks now. Austin is going to Tampa for more tests. Roster Moves: Welcome back, Chris Carter. He was brought back to the big league team today. I guess the Yankees want another first baseman with Austin hurt. Carter was designated for assignment last week and outrighted to Triple-A a few days ago … to clear 25-man roster space for Carter and Fowler, Austin was placed on the disabled list and Andujar was sent down. They want Andujar to play third base everyday. To clear 40-man roster space, Greg Bird (shoulder) was transferred to the 60-day DL and Mason Williams was designated for assignment. This is already Bird’s 59th day on the DL. Going from the 10-day DL to the 60-day DL doesn’t change anything. As for Williams, he loses his 40-man spot to Fowler, who is a younger and better version of Williams. Update (9:12pm ET): The game is in a rain delay and there’s no estimated start time. 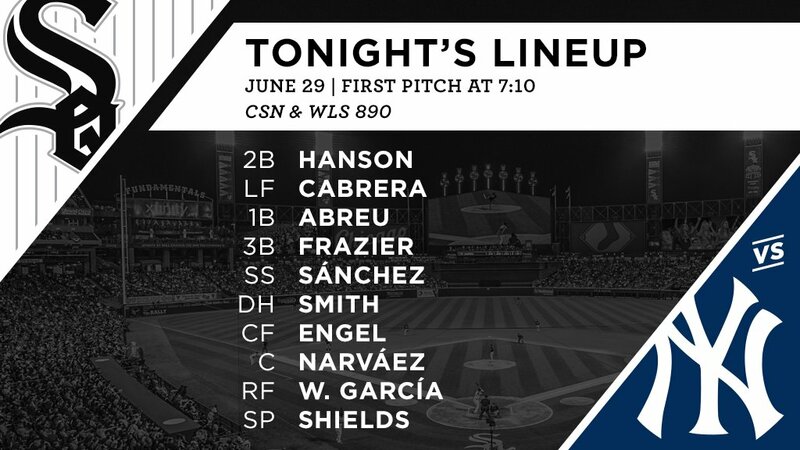 The White Sox say they hope to play the game “at some point” tonight. Update (10:27pm ET): First pitch is tentatively scheduled for 11pm ET. Wheeee. Following tonight’s win, the Yankees designated Chris Carter for assignment and called up Tyler Austin, the team announced. I guess Austin is ready now? A few days ago Brian Cashman called Carter the team’s best first base option. Austin has hit three homers since then and Carter has, well, struck out a bunch. Does he get cut if he gets a hit (or even a sac fly) in the tenth inning tonight? Probably not. Carter hit .204/.286/.383 (76 wRC+) with eight home runs in 189 plate appearances for the Yankees, including Friday’s game. He’d been playing pretty much every day since Greg Bird went on the disabled list in early May, so it wasn’t a playing time issue. We’ll always have that homer in Pittsburgh, Chris. Austin, meanwhile, hit .316/.388/.588 (145 wRC+) with four home runs in 32 minor league games after coming back from his broken ankle. He fouled a ball off the ankle very early in Spring Training and didn’t return until last month. Austin hit .241/.300/.458 (102 wRC+) in 90 plate appearances with the Yankees last season. Bird is still working his way back from an ankle injury of his own — he received a cortisone shot a few days ago and will resume baseball activities soon — and there’s no real firm timetable for his return. He might not be back until after the All-Star break. Once he heals up, I assume he’s take over as the everyday first baseman again. At this point Carter has enough service time to collect his entire $3M salary even if he elects free agency after clearing waivers, so stashing him in Triple-A for depth until Bird is healthy might not happen. Probably not. We’ll see. Either way, hopefully Austin is an upgrade at first base. It’ll be hard for him to be worse. Despite recent events, the Yankees have the second best record (39-30) and the second best run differential (+107) in the American League. Many expected this to be something of a rebuilding year, one of those “step back and regroup for next season” years. Instead, the Yankees got off to a great start and remain in the thick of the division race as we approach the season’s midway point. The All-Star Game is less than three weeks away now — it snuck up this year, didn’t it? — and given their play to date, the Yankees will undoubtedly have multiple representatives in Miami next month. They won’t be one of those “one token All-Star” teams. The internet tells me the Yankees have sent multiple players to the All-Star Game every year since 1992, when Roberto Kelly was their lone representative. The 2017 All-Star Game rosters will be announced either later next week or next weekend. That makes this as good a time as any to look at which Yankees could be selected to the Midsummer Classic. In fact, let’s rank the 25 players on the active roster in terms of their All-Star eligibility. Shall we? We shall. Let’s get to it. Flawless victory. Fatality. See you in Miami, Aaron. Remember Dellin? He’s this really great reliever who used to pitch for the Yankees once upon a time. Betances did actually pitch last night. It was his fifth appearance in the last 24 days. True story! Can you believe that? It’s friggin’ insane. Anyway, Dellin has allowed one earned run — on April 8th — in 22.2 innings this season. He’s struck out 43 and opponents are hitting .117/.261/.117 against him. I think Betances is going to his fourth straight All-Star Game. I do wonder whether the relatively light workload — Dellin ranks 162nd among all relievers in innings (!) — will work against him. I don’t think so though. Betances should be an All-Star again. This is awesome. Severino was so bad as a starter last season. So, so bad. And now he’s a legitimate All-Star candidate. He has a 2.99 ERA (3.23 FIP) through 13 starts and 81.1 innings, and he is among the AL top ten in WHIP (fifth), strikeouts (fifth), ERA+ (fifth), K/BB ratio (fifth), fWAR (fifth), ERA (sixth), FIP (seventh), and bWAR (eighth). Last season eight starters made the AL All-Star team and so far this season Severino has been one of the seven or eight best starting pitchers in the league. He’s not a lock, I don’t think. But he should receive strong consideration. He’s also seventh among all AL players in bWAR. Hicks wasn’t even an everyday player to start the season! He’s been awesome and he should be an All-Star. My guess is Hicks gets snubbed and instead lands on the Final Vote ballot. Maybe he’ll make the roster outright with Trout injured. There are only six outfield spots on the roster though, and squeezing two Yankees into those six spots seems like a thing that won’t happen. Fingers crossed. Man, how awesome has Holliday been this season? He’s hitting .275/.379/.536 (142 wRC+) with 15 home runs and it’s thanks to him that the Yankees lead all AL teams with a 138 wRC+ from their DHs. Nelson Cruz is currently leading the fan voting at DH with Holliday roughly 300,000 votes back in second place. Making up that gap seems unlkely with one week to go in the voting. In recent years there have been two designated hitter spots on the All-Star Game roster, so it stands to reason that even if Cruz wins the fan voting, Holliday could still make it. It’ll be either him or Edwin Encarnacion, who has been insane the last six weeks or so. Now, that said, the All-Star Game rosters were trimmed from 34 players to 32 this year. With two fewer spots, will they not take a second DH? Hmmm. If Sanchez didn’t miss that month with that biceps injury, he’d be a shoo-in for the All-Star Game. The guy is hitting .296/.376/.554 (147 wRC+) with 12 home runs. Only Salvador Perez has gone deep more times among all catchers. He has 15 homers in 257 plate appearances. Gary has 12 in 178 plate appearances. Brian McCann and Alex Avila (?!?) are also having All-Star caliber seasons and neither missed a month with an injury. I think it’s down to Sanchez and Avila for the third spot. Perez is going to win the fan voting and McCann belongs too. He’s been great. A few more Sanchez dingers over the next week could decide this thing. Altuve is going to start the All-Star Game at second base, as he should. Dustin Pedroia’s injury issues mean the backup spot could come down to Castro (128 wRC+), Jed Lowrie (126 wRC), or Robinson Cano (111 wRC+). I suppose Brian Dozier (106 wRC+) is in that mix too. Name value matters in the All-Star Game. Here’s an important factor: will Yonder Alonso make the All-Star team? If not, Lowrie figures to end up the A’s token All-Star, which will hurt Starlin’s chances of making the roster. Can you quietly hit .321/.342/.500 (120 wRC+)? Because Gregorius is doing it. He’s been so good since coming back from the disabled list. And that’s the problem. The disabled list. Gregorius missed a month with a shoulder issue. He was already facing an uphill battle with Carlos Correa, Xander Bogaerts, and Francisco Lindor in the AL. Those three dudes are going to the All-Star Game and they might be the three AL All-Star shortstops for the next ten years. Didi has been great. He’s almost certainly going to get squeezed off the All-Star roster though. Gardner has had a slow June, but he’s still hitting .259/.341/.471 (115 wRC+) overall, and his 13 home runs are eighth among AL outfielders. The problem is Gardner is only the third best Yankees outfielder this season, and there are only six outfield spots on the All-Star roster. Judge is getting one of them. And if they pick a second Yankees outfielder, it’ll be Hicks. No chance for Gardner, unless he’s an injury replacement or something, and even then it’s a long shot. A good but not great season for Michael Pineda, this is. He has a 3.56 ERA (4.05 FIP) in 14 starts and 83.1 innings — hey wait a minute isn’t Pineda supposed to be a ERA > FIP guy? — which is solid, but not All-Star worthy. Montgomery is right there with him with a 3.74 ERA (3.87 FIP) in 13 starts and 74.2 innings. Imagine where the Yankees would be without these two. Nice seasons, not All-Stars. Last season Chapman did not make the All-Star team because he missed a month serving his suspension. This season he will not make the All-Star team because he missed more than a month with a shoulder injury. Also, Chapman wasn’t exactly lights out before going on the disabled list. He allowed five runs and 18 baserunners in 12.2 innings before getting hurt. Aroldis has thrown 14.2 innings this season. 14.2! No All-Star Game for him. Great start! Okay-ish June. Terrible May. Headley is hitting .245/.335/.362 (87 wRC+) overall, and by wRC+, he ranks 21st among the 24 third basemen with enough plate appearances to qualify for the batting title. Better luck next year, Chase. Non-Betances middle relievers have a really hard time making the All-Star Game. Green and Shreve have been the best of this foursome and they’ve thrown 23.1 and 19.2 innings, respectively. Woof. Tanaka has legitimately been one of the worst pitchers in baseball this season. There are 81 pitchers with enough innings to qualify for the ERA title, and Tanaka ranks 69th in fWAR (+0.1), 74th in FIP (5.64), 79th in ERA (3.34), and 79th in bWAR (-0.8). Please be better, Masahiro. At least he kinda plays everyday? That counts for … something. Carter is hitting .201/.287/.384 (77 wRC+) overall and probably wouldn’t make a Triple-A All-Star Game at this point. Remember April? These guys were so great filling in for Sanchez and Torreyes. Romine is hitting .237/.258/.325 (50 wRC+) even after last night’s big game while Torreyes is at .296/.319/.374 (84 wRC+). The next backup catcher and utility infielder I see make the All-Star Game will be the first. If you had to bet a paycheck on one of these four guys making an All-Star Game at some point in their careers, who would you pick? I feel like German is the obvious choice here, though I remain a Cessa fan. Maybe Refsnyder will have a late career Jose Bautista breakout? The Yankees have four regulars on the disabled list right now: Greg Bird, Jacoby Ellsbury, CC Sabathia, and Adam Warren. There is no firm timetable for any of them to return to the Yankees, as far as we know. Warren seems closest since he’s scheduled to resume throwing Friday. Ellsbury was playing well before his concussion. Not All-Star well — he was still the team’s fourth most productive outfielder behind Judge, Hicks, and Gardner — but well. Sabathia was pretty awesome after his four-start disaster stretch in May. Good enough to be an All-Star? Maybe! He allowed six runs (four earned) in his six starts and 36.1 innings before the injury. Imagine he keept that up until the All-Star break. Alas. I think the Yankees will have at least two All-Stars this year (Judge and Betances) and possibly as many as seven (Judge, Betances, Severino, Hicks, Holliday, Sanchez, Castro). Seven’s not going to happen though. Seven All-Stars is reserved for super teams. The Cubs had seven All-Stars last season and that’s only because the fans stuffed the ballot and voted in five starters. So yeah, seven isn’t happening. My official guess is four Yankees make the All-Star team: Judge, Betances, Severino, and Sanchez. Hicks gets hosed, Holliday loses out because they won’t carry two DHs with the smaller roster, and Castro gets squeezed out by other second basemen. The Yankees haven’t had four All-Stars since 2012, when Jeter, Sabathia, Cano, and Curtis Granderson made it. (Jeter, Cano, and Granderson were all voted in as starters.) Four All-Stars would be cool. Two seems like the absolute minimum for the 2017 Yankees.